The Prince of Wales has been coaxing Prince George to follow in his gardening footsteps by helping him plant trees at his Highgrove estate. Prince Charles told BBC Radio 4's Gardeners' Question Time that his grandson has helped to dig in "a tree or two" at his Gloucestershire home. 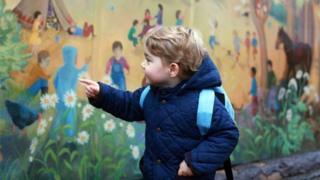 The prince said he has even redesigned some of his gardens to make them more child-friendly. He also described how his own passion for gardening started in his childhood. Speaking from Highgrove the prince said: "You never know, do you, what people are going to be interested in. "The most important thing is I got him planting a tree or two here, so we planted it together and shovelled in the earth. "That's the way, I think, when you are very small, and then each time they come you say, 'Do you see how much the tree has grown, or whatever?' and you hope that they take an interest." Prince Charles described his passion for gardening as a "marvellous, therapeutic business... you can get reward from it but you can also be driven mad by it". He said his interest was sparked by pottering around in the garden at Buckingham Palace, where he tended a little plot near Constitution Hill, and also by spending time with his grandmother, The Queen Mother, at Royal Lodge in Windsor Great Park. "I always like gardening - I hate to say this - from a child's point of view. It's a funny thing, because I have such happy memories of bits of garden at my grandmother's house. "In Scotland and here I have tried to design it with what would appeal to a child; it is the paths and the interests. "I have tried to do that at Dumfries House as well. We have made a maze now up there which is rather fun, and I adored a maze when I was young. You just put yourself in the child's position and sometimes it works." Gardener's Question Time will broadcast on BBC Radio 4 at 15:00 BST on Friday.